Welcome to the Ranger's Cabin! Follow the elk hoof prints to the 100 year old door that welcomes you into this one of a kind, newly handcrafted Wyoming log cabin. 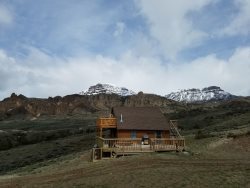 Designed and built by the Wyoming owners, this well thought out, serene, stand alone cabin is situated on 5 acres with pristine panoramic mountain views. You will enjoy the quiet, stare in amazement at the starlit sky and ponder the incredible beauty that surrounds you in the beautiful Wapiti (elk) Valley. A great location to enhance your vacation to YNP, Shoshone National Forest, the Beartooth Mountains, Cody and all the outdoor adventures and scenic byways this area has to offer. The studio cabin has a king size bed and full size pull out sleeper. Just right for a single or couple with up to two younger children. (The layout does not offer privacy between sleeping areas) The bathroom features a custom built vanity and gorgeous tiled shower. Kitchen amenities include: apartment size stove/oven, under cabinet refrigerator, microwave, standard and kuerig coffeepots, toaster, cookware and tableware for 4 people. There is a small seating area and gas barbecue grill outside. Our goal is for you to enjoy the great outdoors, this property does not have internet or TV. There is cell phone reception for most carriers. Come and experience how and why we live in the West and see if Wyoming grips you too! I really didn't deal with anybody except Sandi since I booked the Ranger cabin online. She answered any questions that I had and was friendly to deal with. The ranger cabin is perfect for two. The bed and futon were pretty comfy. You don't need a/c since it cools down so much in Wapiti Valley in the evening. The location is ideal for visiting Yellowstone at the east entrance. The Buffalo Bill Center is a definite must- do for any visitors to Cody. We're especially enjoyed the many national forests and parks in the surrounding areas. I would recommend the Ranger cabin to anyone looking to stay in a nice, quiet and serene location away from it all. We enjoyed the cabin. We just wish that we had been a bit closer to the entrance to Yellowstone. Perfect place away from crowds. Loved the cabin beautifully decorated. Loved our stay at Ranger cabin - great getaway, beautiful location and so peaceful at the end of days spent in Yellowstone! Cabin was as described online. Awesome view from front porch. The staff I interacted with was helpful and always very polite. They also provided some info about the area as well. The cabin provided a quiet stay in the middle of the mountains outside the gates of Yellowstone mountains. It was my first time traveling through that area and it was amazing. I feel like my husband and I really got to experience a piece of the West and Wyoming. The cabin is like a dream and really such a special place. You have to see it for yourself!! The pictures don't even do the place justice...and that is saying something! I feel like my husband and I really got to experience a piece of the West and Wyoming. The cabin is like a dream and really such a special place. You have to see it for yourself!! The pictures don't even do the place justice...and that is saying something! Thank you so much , we will be back and made many memories there. It was so special!! They were very helpful informing me about the opening dates for the gates at Yellowstone. Otherwise My husband & I would have booked too early & Yellowstone would not have been accessible from the East gate. We are SO appreciative of their attention to detail. It was our Yellowstone home away from home! We enjoyed every minute of our 10 day stay! The Ranger cabin was perfect! Location, views, everything about it was exactly what we needed! Great to work with at every level. Answered our emails quickly, addressed specific questions and offered helpful suggestions too. Ranger's Cabin was just perfect for our needs as a couple. Small, private, and a great western experience, while also living in quality comfort. Couldn't have been any better for us on our 25th Anniversary Trip. Many thanks to the owners for sharing it with us! Excellent service a to z. Well done. We loved it. Would go again tomorrow. - An 8% lodging tax is assessed on your rent and cleaning rate. - A cleaning fee of $50 will be charged to your reservation.